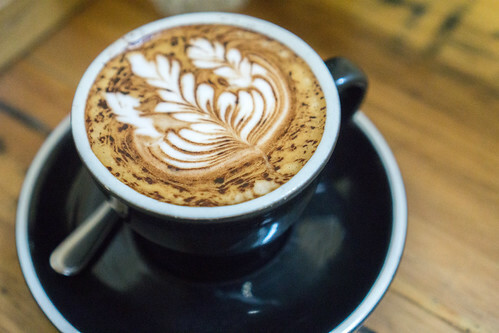 Little Rogue is tucked away in one of Melbourne’s many laneways and it almost seems strange to come from the always crowded Swanston St and find this gem on the relatively quiet Drewery Lane. 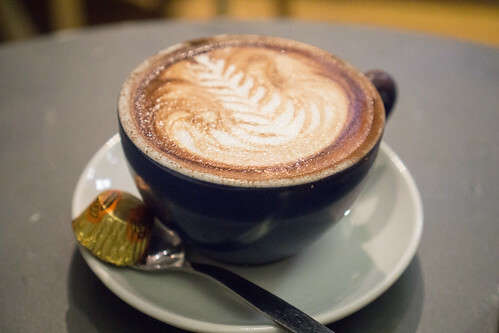 Little Rogue is famously known for its Matcha Lattes and coffee and there’s usually a selection of small bites sourced from other local suppliers such as donuts from Shortstop or baked goods from Penny for Pound. Their Matcha lattes is what every person seems to come to Little Rogue for, and rightfully so, because their lattes are fantastic. It’s smooth, frothy and has an amazing bold, slightly bitter green tea flavour. It’s honestly unmatched. 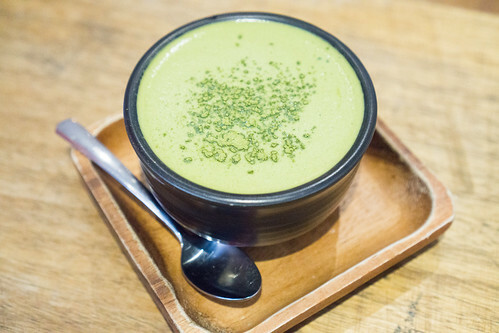 If you want your Matcha latte fix. This is it. 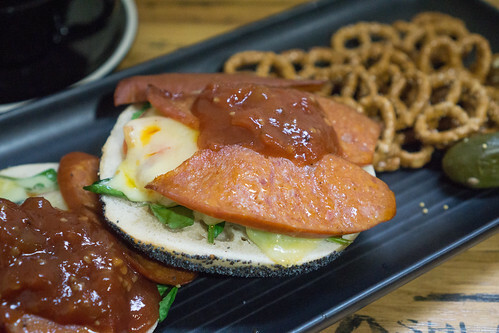 Miss Korea Kitchen located along Burke Road in Camberwell, serves fresh, healthy and authentic Korean cuisine. 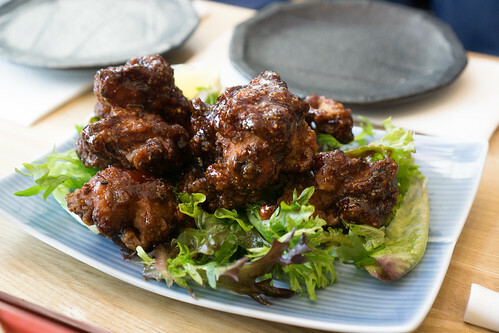 They offer the typical Korean dishes such as Korean Fried Chicken, Bulgogi, Bibimbap, Korean BBQ with customers being able to choose their protein (e.g. chicken, beef, pork or veg) with many of their offerings. 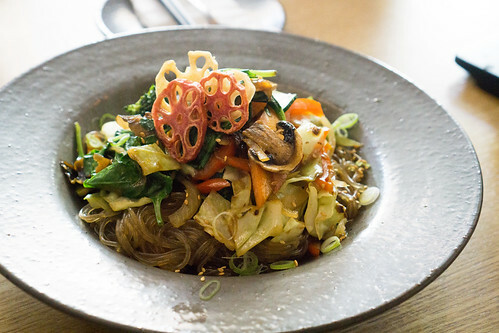 The Japchae at Miss Korea Kitchen is one of the better Japchae’s in Melbourne. It’s closest competitor and reigning champion is Don-Udon‘s flavourful Japchae. 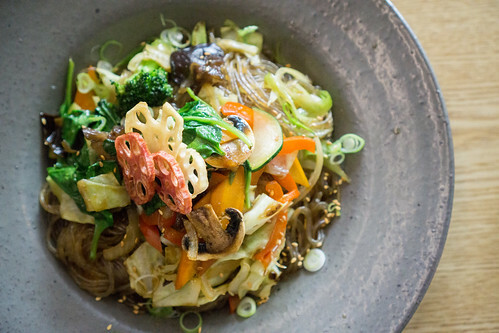 Here, the Japchae has that subtle work flavour with fresh vegetables and crispy lotus root on top. The flavour is a bit more subtle overall as compared to Don-Udon’s version but it’s tasty nonetheless. You can order their Japchae with Beef, Pork, Chicken, Tofu, Veg or Seafood which are pretty much all the options you could think of. 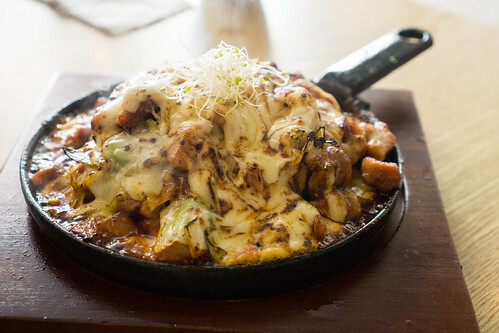 The best Cheese Buldak or Chicken and Cheese Bulgogi Hotplate is CJ Lunch Bar‘s offering. Here, I found the chicken to be overcooked and the seasoning unbalanced with the sauce being overly salty and needing just a bit of sweetness and more depth in flavour to match CJ Lunch Bar’s. The richness of the cheese though, helps complement the spiciness so that’s a definite plus. 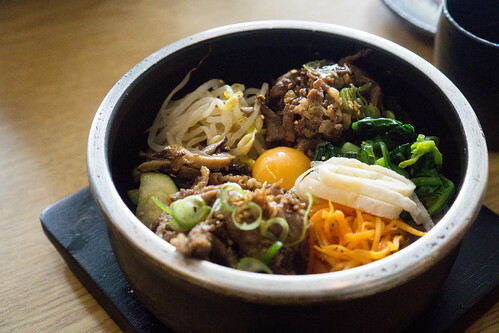 I’m going to again, compare Miss Korea Kitchen’s Stone Pot Bibimbap with Don-Udon (Box Hill) where their Don-Udon has such amazing flavour to it from how they cook each of the components and the addition of the chilli paste. Miss Korea Kitchen’s Bibimbap isn’t bad, each element has flavour to it but it’s definitely not as flavourful as it could be. I saw this Mini Patbingsu on the menu, which is basically a Korean version of an Ice Kachang or Japanese Kakigori. 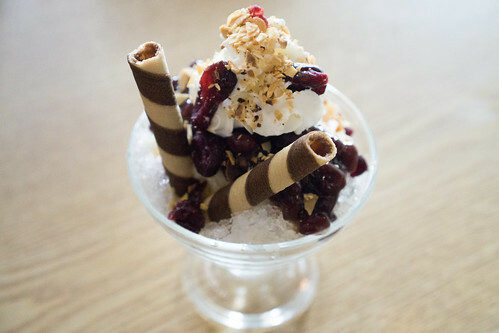 Their Patbingsu comes with chopped fruit, red bean, fruit syrup, condensed milk and wafers. For $8 it’s actually quite small and flavour wise it’s quite lacking. The shaved ice is very coarse with not enough condensed milk to add that richness it needs. The whipped cream topping lacks flavour as well so the overall result is a pretty bland and expensive dessert. Ignoring the Patbingsu dessert, I found Miss Korea Kitchen to have overall tasty Korean dishes and it’s one of the better ones I’ve been to in Melbourne. 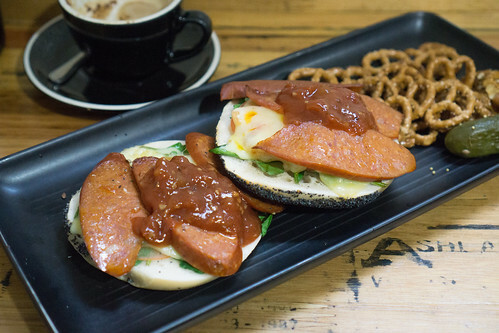 Located in Eastland’s Town Square, Kyoto Cafe provides a bit of Japanese flavour to Ringwood. Its interior is reminiscent of modern Japanese restaurants with its generous wood panelling all around. It has an open kitchen with kitchen-side dining, and room upstairs as well. While Kyoto Cafe do offer a few Donburi’s (Rice bowls), they do have a more extensive Yakitori menu, as well as tapas dishes, sushi and bento choices. 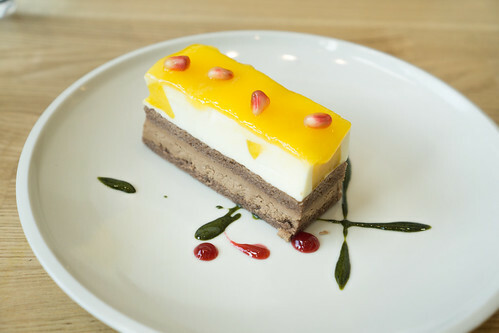 They also offer a few dessert options, most are displayed at the front of their restaurant which are basically a variety of cakes and cream puffs to choose from. 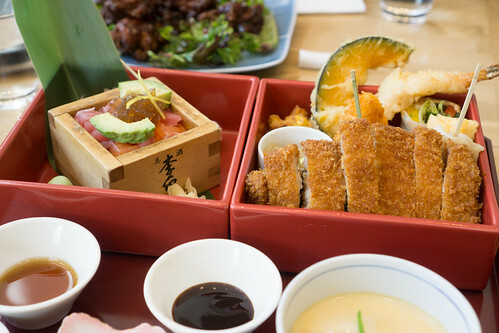 One of their bento options comes with fresh sashimi, tempura, chicken katsu and steamed egg with dipping sauces. 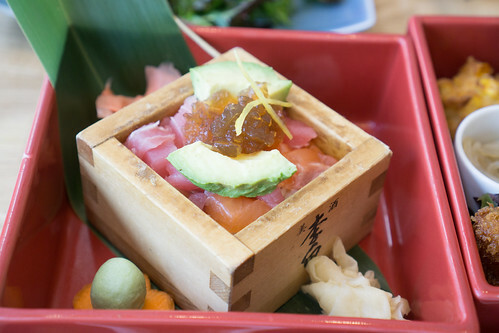 The sashimi were sliced into smaller pieces, but tasted quite fresh. 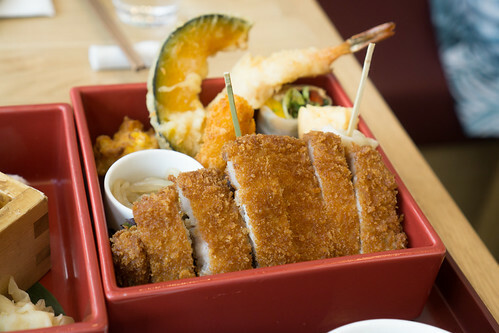 The chicken katsu was crispy, and tender, while the tempura was also crisp with a light batter surrounding it and soft inside. There was also this odd vegetable wrap, I wasn’t fond of it and tasted a bit bland. 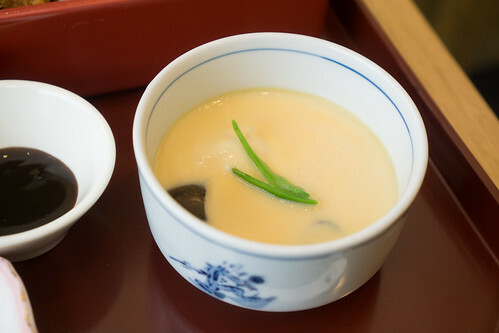 The steamed egg wasn’t as soft as I would have liked either and also was a tad under seasoned but still one of the better ones I’ve tried. The Japanese Fried Chicken here has this very dark, sticky glaze on it. The chicken was tender and crisp but I wasn’t overly impressed by the flavour of the marinade. Just give me the normal Chicken Karaage. To be honest, the main reason for coming to Kyoto Cafe was to try their desserts. The Yuzu cake had an amazingly punchy Yuzu flavour with a soft mouse layer, and a cake base. 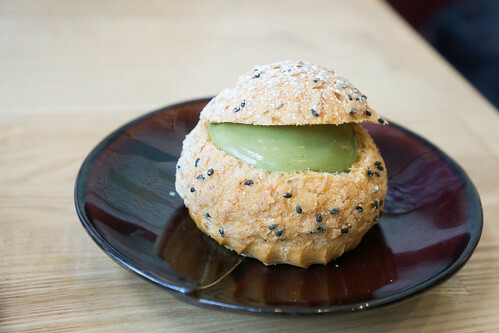 The Green Tea cream puff wasn’t as crunchy as I’d like but it had a great Matcha cream flavour inside that kinda oozed out. The Black Sesame flavoured one is on the list to try! 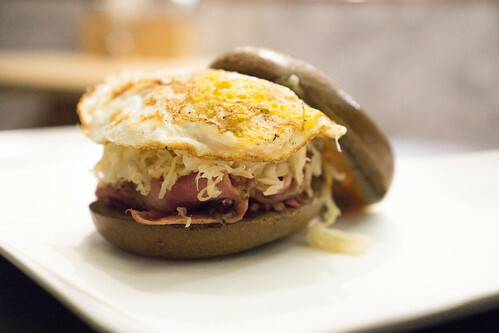 The ambience at Kyoto Cafe makes for a great dining experience. 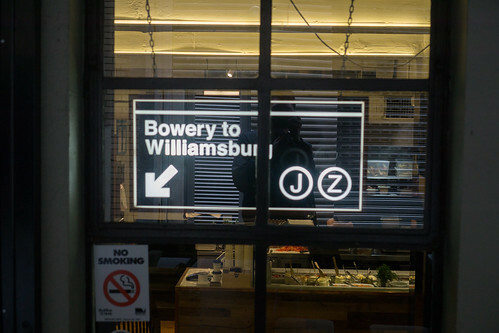 The food here, while it may not be amazing, will give you a tasty meal and sometimes that’s all you’re after. The beautiful desserts don’t hurt either.